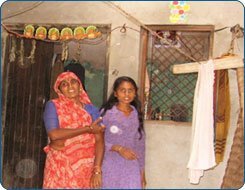 Read the story of Suman and how the house she was able to build with Habitat has brought her family a place of safety, and has brought Suman a sense of pride. Standing next to her young daughter, Suman smiles as she shows her house to us with pride and a sense of contentment. In her mid forties, Suman believes that a home brings security to the family. It means providing a safe environment for her children from factors that make them vulnerable to exploitation. A house also gives her and her family proper sanitation and toilet facilities. It also gives her children an enabling environment for survival, growth and development, a place where they can study in peace, where they can play, and live together as a family. Suman is one among the Habitat homeowner who lives in Mundi village in Rewari district in Haryana (North India). Without a proper house, life was difficult for Suman and her husband with their four children. Her husband, a daily wage labourer frequently suffers from mental disorder, thus cutting off his source of income when he is not working. Suman supports the family by tailoring and rearing buffalos. Initially it was just one room with a thatched roof and the whole family had to share this small space. Suman was also worried about her young daughter and her privacy. She recalls “whenever visitors would come home, it was difficult for us as there was no space especially when my daughter has to bathe before going to school or after coming back from school (pointing towards a small area next to the room) we had to wait till the visitors leave then only one could use the bathing area.” Suman was a member of the self help group (SHG) in her village through which she came to know of Habitat. She grabbed this opportunity. Now Suman is happy that the family has enough privacy in their house. Suman is a proud homeowner today. Give other families the chance to be proud in a home of their own by supporting the Habitat India Youth BUILD! Create a support page and encourage your friends and families to do the same.